Corrosion Industry Events | Matcor, Inc.
Did you know that corrosion costs us an astounding 2.5 trillion dollars globally? Today is corrosion awareness day, so we thought it would be a good idea to reiterate the importance of the NACE IMPACT (International Measures of Prevention, Application, and Economics of Corrosion Technologies) study released in 2016. According to the study, most corrosion failures, and nearly all catastrophic corrosion failures are preventable. And nearly $875 billion can be saved through the right prevention and risk analysis efforts. Through the IMPACT study, NACE determined that in order to reduce the astronomical cost of corrosion, we would have to change how decisions are made regarding corrosion. We must not only continue to develop corrosion control methods and technology, but we must utilize organizational management systems and risk tools throughout all levels of an organization to achieve the greatest success in saving lives, jobs and money. You can learn more by visiting impact.nace.org. MATCOR senior corrosion engineer Jeffrey L. Didas will present “Management of Pipeline Casing Issues” at Corrosion 2017, taking place March 26-30, 2017 in New Orleans, LA. Pipeline casings are an issue whether clear or shorted. This presentation will cover the various issues with casings and what, if anything, can be done to remediate these issues. Mr. Didas’ discussion will include pipeline casing cathodic protection (CP), casing filling, casing removal and more. Mr. Didas is senior corrosion engineer for MATCOR and an industry expert with over 42 years of diverse corrosion experience and the highest level of NACE certification. He also currently serves in the elected position of vice president elect for the NACE Board of Directors and has held a variety of national positions. We recently joined fellow Brand Energy company SGB Scaffolding and Industrial Services as Silver Sponsors of CORCON 2016. 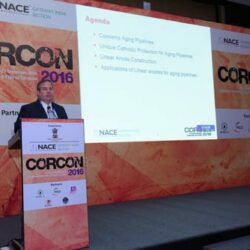 CORCON, held in September in Delhi, is NACE International Gateway India Section’s premiere event in India and NACE International’s 2nd largest conference. 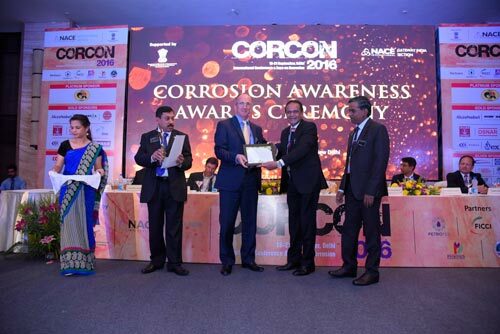 Mr. Shailesh Javia, division head for SGB in India, was awarded the NIGIS Corrosion Awareness Award, presented to individuals and institutions for their contribution to corrosion awareness and developments in the field of corrosion science and technology in India. Mr. Ted Huck was awarded Best Paper in the cathodic protection track for his presentation entitled AC Interference Modeling And Mitigation Materials. To learn more about MATCOR’s cathodic protection systems and AC mitigation materials, please visit matcor.com/products. 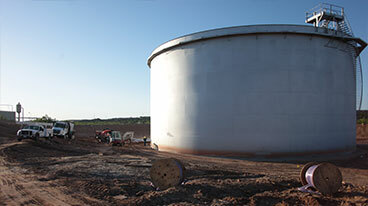 If you have questions or need assistance please complete our web form to connect with our corrosion experts. To learn more about SGB, please visit sgbgroup.com. Chalfont, PA (Aug 31, 2015) – MATCOR, Inc., the trusted full-service provider of proprietary cathodic protection products, systems, and corrosion engineering solutions recently announced that the company has joined forces with CP Masters, Inc. The combined company will be known as MATCOR. CP Masters brings 30 years of cathodic protection technical and system installation expertise to the MATCOR team. In addition to industry-qualified and experienced people, the company maintains one of the industry’s largest fleets of construction equipment. Chalfont, PA (April 27, 2015) – MATCOR, Inc. the trusted full-service provider of proprietary cathodic protection products, systems, and corr osion engineering solutions will present a paper exploring the use of flexible impressed current linear anodes to minimize current densities for a wide range of cathodic protection applications at the annual NACE UAE Corrosion Conference held at the St. Regis in Abu Dhabi, United Arab Emirates May 12-14, 2015. The presentation explores flexible impressed current linear anode cathodic protection that extends the benefits of linear anodes for various CP applications. To minimize current distribution challenges, the linear anodes are designed utilizing multiple internal connections, which provides redundancy and protection against uneven anode consumption, minimizes current densities and allows placement in close proximity to the structure. The linear anode is simple to install, requiring only a small trench, and is ideal for congested areas and tight spaces. See below for the complete abstract. Shailesh Javia serves as International Director for MATCOR and has over 22 years experience focused on corrosion engineering and cathodic protection. His diverse knowledge and experience includes designing cathodic protection systems, managing turnkey CP projects and conducting commissioning surveys for cross country and city gas pipelines, tanks and vessels, tank bottoms, and industrial facilities including fertilizer, petrochemical and power plants, and refineries. Mr. Javia is a certified NACE Cathodic Protection Technologist, has successfully completed the NACE Direct Assessment Course and has presented several papers at NACE and ASME conferences. of linear anodes to a wide range of cathodic protection applications. Tight spaces, high traffic areas, poorly coated pipelines, new construction tank bottom, tank bottom retrofits, reinforcing steel-in-concrete, sheet pile walls or inside large diameter pipes – are all good examples of linear anode cathodic protection applications. structure. Linear anodes require only a small trench for installation, ideal for congested areas and minimizing landowner “right of way” issues. Chalfont, PA (March 12, 2015) – MATCOR, Inc. the trusted full-service provider of proprietary cathodic protection products, systems, and corrosion engineering solutions will present a paper comparing three AC mitigation methods to reduce corrosion in pipelines at the annual NACE conference held at the Kay Bailey Hutchinson Convention Center in Dallas, Texas March 15-19, 2015. The presentation explores AC mitigation grounding systems to prevent corrosion leaks in pipelines. Using a test bed at an electric and gas facility, the ability to reduce the AC voltage were measured via three methods: zinc ribbon anode, bare copper grounding and an engineered system. The data suggests AC mitigation installed at least ten feet or more from the pipeline is effective which also offers additional safety to the installers. 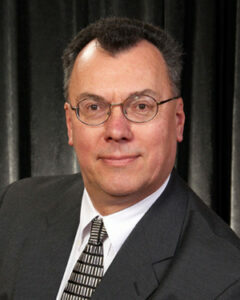 Christopher Sheldon, PE serves as Practice Lead, Utilities and has been with MATCOR since 2011. With more than 25 years of engineering experience, Mr. Sheldon has spent the last 15 years focused on corrosion engineering. Mr. Sheldon has completed cathodic protection designs for underground gas, electric and generation facilities. 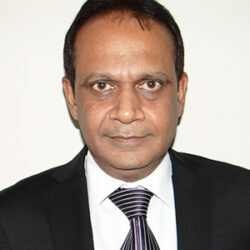 He has co-authored white papers on AC Mitigation and is certified as a NACE CP Specialist and Coating Inspector Level 1. He has authored multiple papers and speaks at corrosion conferences around the world. 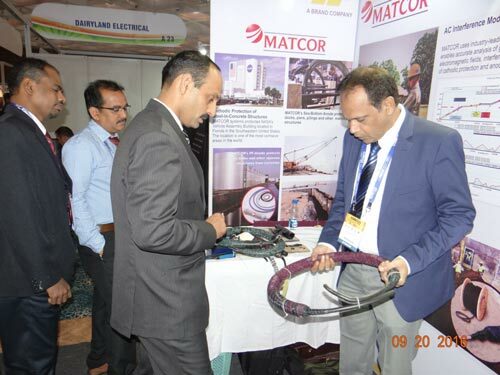 Chalfont, PA – November 4, 2014, MATCOR, Inc., the trusted full-service provider of proprietary cathodic protection products, systems and corrosion engineering solutions, will present two technical papers at CORCON, NACE International Gateway India Section’s premier conference, taking place at the Hotel Grand Hyatt in Mumbai, India November 12 – 15, 2014. This presentation examines a self-contained deep well anode system for cathodic protection of cross country pipelines, city gas pipelines, plant piping and well casings, ideal in congested areas where land is a constraint. The system utilizes a titanium wire with a mixed metal oxide thermally applied coating as the active anode element. The continuous anode element is factory assembled with continuous integral vent pipe and lowering rope to simplify installation. Learn about MATCOR’s deep anode solution. This presentation will provide an overview of Pipeline Integrity Management programs utilized in the United States and around the world highlighting some of the key aspects of a successful program including; initial pre-assessment efforts, collecting and managing indirect survey data, the importance of direct examinations, risk assessment and reporting practices. 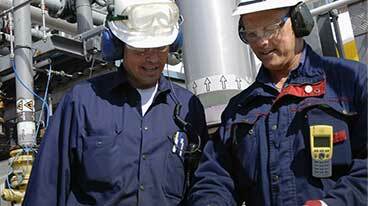 Learn about MATCOR’s Pipeline Integrity Management Services. Mr. Ted Huck, Vice President International and Practice Lead for MATCOR is an electrical engineer and a recognized expert in cathodic protection, authoring over a dozen articles in a wide range of publications and speaking at corrosion conferences worldwide. Mr. Shailesh Javia is an electronics engineer and NACE certified Cathodic Protection Technologist with 22 years of experience focused on corrosion engineering and cathodic protection. 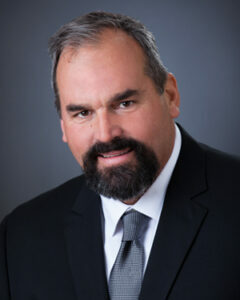 His diverse portfolio includes the design of cathodic protection systems and managing turnkey projects for cross country pipelines, plants, tank bottoms, tank and vessel internal cathodic protection, city gas pipelines, post commissioning surveys and handling complex interference problems on cross country pipelines. Chalfont, PA – April 28, 2014, MATCOR, Inc., the trusted full-service provider of proprietary cathodic protection products, systems and corrosion engineering solutions, announces that Ted Huck, Vice President, will present Impressed Current Linear Anode Applications in Congested Plant Environments at the first NACE European Corrosion Conference & Expo, taking place May 14-16 at Monastery of San Lorenzo Del Escorial – a UNESCO World Heritage Site outside of Madrid, Spain. Mr. Huck’s presentation will take place on Thursday, May 15, 2014 from 10:00 am – 10:30 am in Room A. Visitors can view the full conference agenda here. Cathodic protection in congested underground environments such as those commonly found in plant environments can present challenges for cathodic protection designers and engineers. This is especially problematic when trying to design around plant earthing systems, which can render a cathodic protection system ineffective when electrically tied in to the structures that are intended to be protected. Cathodic protection system designs based on isolating piping and other structures from the plant earthing systems require constant testing over the entire life of the cathodic protection system – often not a practical strategy. One very effective strategy is the use of linear anodes placed in parallel to the piping systems during construction. These closely coupled low output systems can effectively provide cathodic protection even in the presence of significant plant earthing systems. 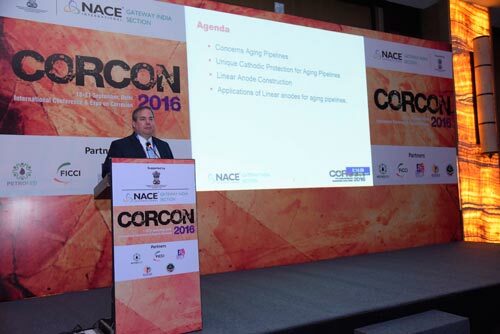 Mr. Huck’s presentation provides details on the proper application of linear anodes for these applications. MATCOR’s most recent innovation is the patented Iron Gopher®, the industry’s first linear anode product developed specifically for horizontal directional drilling (HDD) installation. 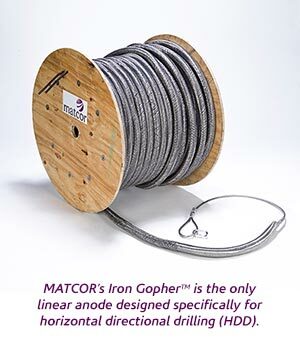 For further technical and product information about Iron Gopher or any of MATCOR’s innovative cathodic protection products, or to contact your MATCOR Account Manager, visit www.matcor.com or call (US. & Canada) 1 800-215-4362 (Worldwide) +1-215-348-2974. 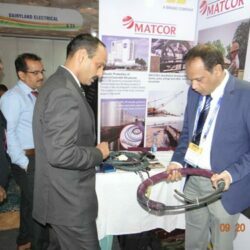 MATCOR is a full-service, ISO 9001:2008 certified provider of customized cathodic protection systems to the oil & gas, power, water and other infrastructures industries. Cathodic Protection is a technique used to control the corrosion of a metal surface through the application of electric current. MATCOR has an array of proprietary cathodic protection products and systems combined with high-quality corrosion engineering, installation and maintenance services. In business for 40 years, MATCOR is considered the technology leader in the cathodic protection and corrosion engineering fields. MATCOR is headquartered in Chalfont, PA, has a service office in Houston, TX and recently established a presence in Ahmedabad, India. The company provides turnkey services throughout the United States and has a growing list of international distributors. MATCOR has been named to the Inc. 5,000 list of fastest growing companies in 2011, 2012 and 2013. 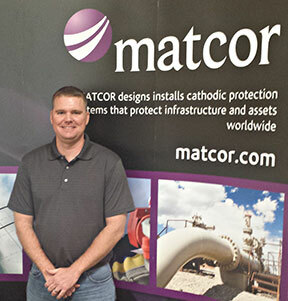 Chalfont, PA – April 24, 2014, MATCOR, Inc., the trusted full-service provider of proprietary cathodic protection products, systems and corrosion engineering solutions, recently hired Isaac Renfro, a graduate of the NACE Foundation Workforce Development Program. The company also supports the program year-round through staff involvement and financial support. In addition to hiring a recent program graduate, MATCOR supports the NACE Foundation on an ongoing basis by encouraging staff volunteerism. Jeff Didas, Practice Lead-Pipelines for MATCOR, serves on the NACE Foundation Board of Directors and as a mentor. Nickalaus Judd, Director – Field Operations for MATCOR, also serves as a mentor. And, in in honor of World Corrosion Awareness Day on April 24, MATCOR recently made a donation to financially support the ongoing efforts of the Workforce Development Program. 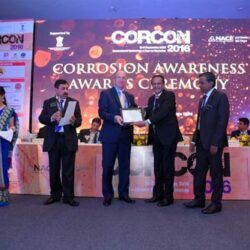 The World Corrosion Organization designated April 24 “Worldwide Corrosion Awareness Day” in 2010 to promote education and best practices in corrosion control for the socio-economic benefit of society, preservation of resources, and protection of the environment. Chalfont, PA – February 2, 2014, MATCOR, Inc. the trusted full-service provider of proprietary cathodic protection products, systems and corrosion engineering solutions, announces the company’s participation in the 15th Annual Middle East Corrosion Conference and Exhibition in Bahrain from February 2th through 5th. MATCOR is a respected innovator in the development of impressed current cathodic protection anode systems and has received numerous patents for its custom anode solutions that protect buried gas and water pipelines, above ground storage tanks, near shore marine structures including piers, docks and sheet pile walls, and reinforcing steel in concrete structures. Featured as one of Forbes’ Magazine’s fastest growing small companies, MATCOR continues to expand its presence in markets globally while maintaining its leadership position as an industry innovator.